Yesterday a friend asked me whether I had any advice to share as she tackles her first half marathon this weekend. I gave her my favorite tips and joked about turning them into a post. Then this morning I realized it was National Running Day (thank you, internet) and figured, hey, perfect time to share these tips! These tips are great for race newbies, or anyone really. I use them all the time. 1. Keep as much on your routine as possible before your race, especially with food and sleep. This can be challenging if you're traveling, or have babies who wake up in the middle of the night, but routine is key with running. I think my half marathon was made a little more challenging because the day before was my birthday and while I didn't go crazy with food and drink, I did eat some things that were off my usual pattern. 2. Stay loose before the race. Stretching is so, so important all the time. I've always felt best running when I alternate with yoga. When you're watching TV or whatever, add in some extra gentle stretching to help stay loose. 3. Follow your fuel routine during the race. Paralleling #1, it's important to stay consistent with your race day fuel. I knew this was a no-no but the week or two before my half marathon I had been trying some new organic energy packs and I thought it would be fine for the race. I should have just stuck to what I had been toting on long runs (Larabar). Similarly, with hydration, if you run out of whatever you run with (if you run with a belt) and are used to Gatorade type drinks, accept them at the water stops. Otherwise, just go with water. During my half marathon, I didn't have problems with Gatorade but some other runners around me weren't feeling so hot since they weren't used to it. 4. Control your pace out of the gate. When you run a race, with the crowd and adrenaline and everything else, it can be hard not to zoom out the gate, but try to be mindful about keeping your usual pace. During my half marathon I ran my first 6 miles a lot faster than my typical pace and I ended up suffering for it (cramps, etc.). 5. Breathe through the hills. When I started training on hills last year, I developed a technique that works so well; I'm no longer afraid of hills because of it! When you get to a hill, look down towards your feet (not up at the intimidating climb!) and focus on breathing steadily to a count of 30. At the end of 30 if you're not at the top of the hill yet, repeat. Focusing on the breath will help a lot! 6. Breathe into your body parts. This is related to #5 and may sound a little weird, but I use a similar 30-count technique if I start experiencing pain on the course (e.g., cramps, tweak in my ankle, bunion pain) or just need a little redirecting. It's a little like meditating while running. Breathe steady to 30 counts and direct your focus to the area in need. If it's a painful area like a cramp I'll imagine each breath dissolving a piece of that pain away. If I'm redirecting then I'll think something like "light feet" or "strong ankles" as I breathe into that area. If I'm on a long run, I'll often use this 30 count technique through all of my body parts! 7. Exercise that beautiful mind. Can you tell how important focus and redirection is to me? One of the other things that helps me pass the time during runs is my own mind. It may sound crazy, but I don't run with music and look forward to running as my time to think -- about dreams, things to do, creative plans, the trajectory for talks I'm giving. Between work and kids and tech and everything else, running really is the only time when I'm truly alone with my thoughts. No joke, I've come up with some of my best creative ideas while running and it is incredibly effective for passing the miles too! 8. Feed off the crowds or a buddy. Some people are a little nervous about crowds at races, but I say ENJOY THEM! After my half marathon I realized that I think I would have done better with a buddy on the course (even though I normally run alone), so we could help push each other. 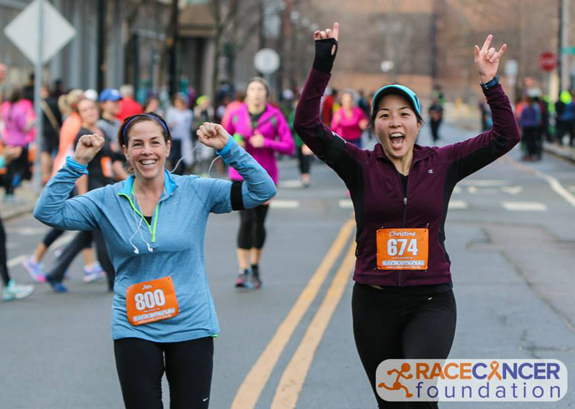 That was the case when I ran a winter 5 miler with my friend Jen (pictured above) and it was really great (don't we look like we're having fun??). But barring running with a friend, the crowds at the half really helped carry me to the end at the half. Do you have other favorite race tips to share? I'd love to hear them in the comments below!